Sharp and SoftBank have just announced a new addition to the Android One collection available on the Y!Mobile MVNO – the Android One X4 (X4-SH) – to be released on 7 June 2018. Being an entry class phone, the X4 won't amaze you with specifications, but will still provide comfort and convenience that even other mid-range phones can't. The Android One X4 is actually the same phone as the Aquos Sense Plus that SoftBank announced in the beginning of May. The Android One X4 comes with a 5.5-inch display with the Full HD+ resolution of 2160 x 1080 pixels, giving it a screen aspect ratio of 18:9. The display is an IGZO LCD, which guarantees excellent energy-saving, high sensitivity, including when used with wet hands or gloves, and image quality that compares with Sharp's Aquos TVs – the Rich Color Technology Mobile is adopted for a great viewing experience. The Android One X4 rear camera has a 16.4-megapixel HD fast-focus (hybrid) sensor. The front-facing camera is 8 MP and the screen glows white when shooting in a low-light environment so that faces retain their natural brightness. The Android One X4 is powered by the mid-range Snapdragon 630 processor that has 4 x 2.2 GHz and 4 x 1.8 GHz cores. The phone comes with 3 GB of LPDDR 4X high-speed RAM and 32 GB of built-in storage. The max. supported size microSD cards is 400 GB. The Android One X4 supports Wi-Fi b/g/n/ac at the standard 2.4 GHz and the high-speed 5 GHz frequency. Bluetooth 5.0 is available, and GPS functionality has been increased by adding support for multiple positioning systems, e.g. GPS, GLONASS, BeiDou, GALILEO, and MICHIBIKI. NFC/Felica (Osaifu-Keitai), and OneSeg digital TV are also featured. A fingerprint scanner is mounted in the bottom bezel that also doubles as a Home button. The X4 is waterproof and dustproof. It can also provide optimal music listening comfort as it supports playback of WAV/FLAC and DSD (DSF/DSDIFF) formats where reproduction quality equals that of a CD player, thanks to the Qualcomm aptX HD codec for high-resolution audio. You won't have to compromise with your headphones either – or have to bother use adaptors – because the Android One X4 has a standard 3.5 mm audio jack. It also has a USB Type C port + Quick Charge support. 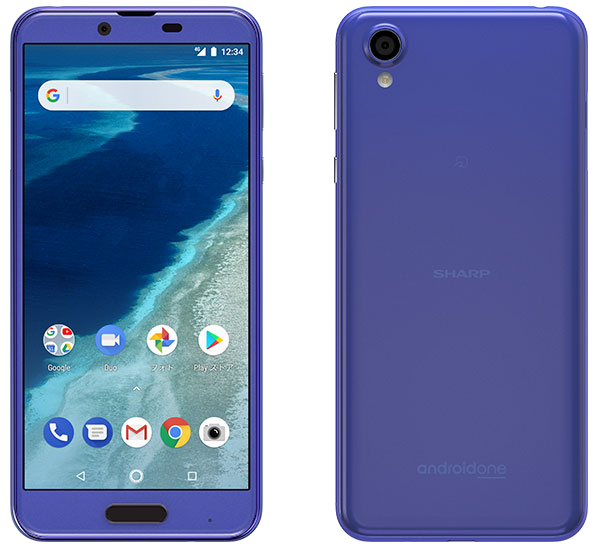 This being an Android One smartphone, it is focus around Google services – meaning you will get regular updates and upgrades, with Sharp promising at least three full years of support from the launch date, and at least two major OS upgrades. This phone will be available in ocean blue, pearl white, and Bordeaux pink. The Android One X4 measures 71 x 151 x 8.9 mm (protrusions excluded) and weighs approx. 157 grams.